Disclaimer: the comments and opinions expressed in this review are the results of our own (limited!) experience with the product. As always, we try to provide context to give a fair overview of the product. We strive to remain impartial and unbiased, and we have not received any payment or compensation of any form for writing this article. The manufacturer came to the 3DExperience Lab in Dassault Systèmes offices to perform a demo of their Open Technologies SIAB-FX 3D scanner. Today, we are doing a hands-on review of the new Open Technologies Scan in a Box – FX. Stefania Tosa and Stefano Capoferri, both sales managers at Open Technologies, came to Dassault Systèmes offices in Vélizy, a town near Paris. Vélizy is famous for being home to a number of very large companies, including PSA, Thalès, Bouygues and General Mills. Within Dassault Systèmes, the demo was hosted at the 3DExperience Lab, a laboratory with the goal of nurturing and empowering disruptive projects. The 3DExperience Lab is already equipped with several 3D printers (including an Ultimaker 3+ and a Markforged Mark One) and 3D scanners. Run by CAD and design experts, the 3DExperience Lab was the perfect place to conduct this hands-on demo. 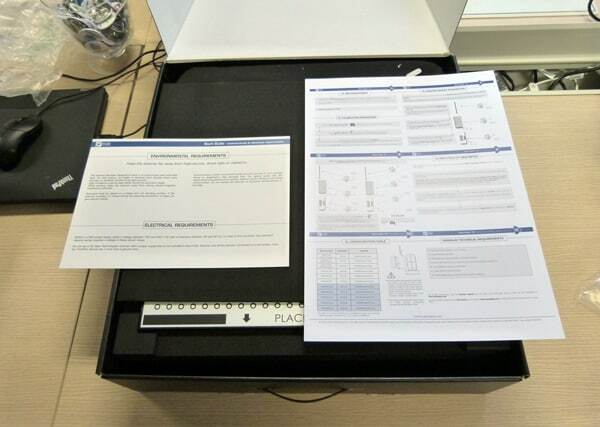 The Open Technologies Scan in a Box – FX, often called SIAB-FX, was sent to us a few days prior to the event by mail. 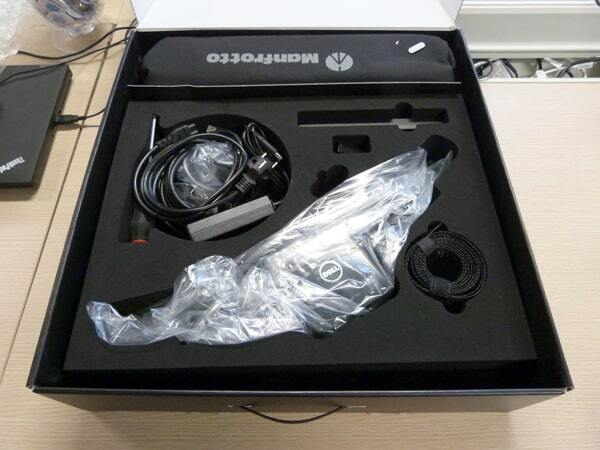 Therefore, we were able to witness the full installation of the 3D scanner, including its unboxing. The Open Technologies SIAB-FX comes in a very large cardboard box, full of styrofoam. This primary packaging contains two smaller cardboard boxes. The first one includes the 3D scanner and its accessories, while the second box contains the automatic turntable. Note that this turntable is optional, available separately for €890. Both secondary packages boast a nice finish and thick foam protections. The SIAB-FX 3D scanner accessories. We can’t help but notice that the calibration plate comes with a sturdy metal support, instead of the weak acrylic version available for the standard SIAB. Given the weight of the calibration plate, this is appreciable. 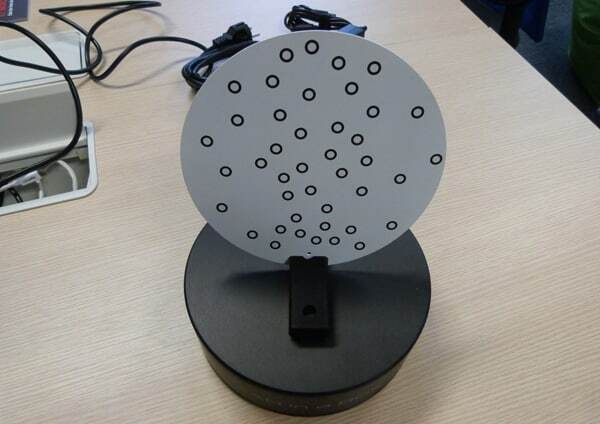 The Scan in a Box – FX’s calibration plate and support stand. The SIAB-FX is the upgraded version of the SIAB. It offers a more powerful video projector, the Dell M115HD with a contrast ratio of 10,0000:1 and a 450 lumens image brightness. The ASUS S1 that comes with the SIAB offers only a 1000:1 ratio and a 200 lumens image brightness. The Automatic TurnTable (ATT) comes with its own cables (power and connectivity) as well as its own calibration plate. 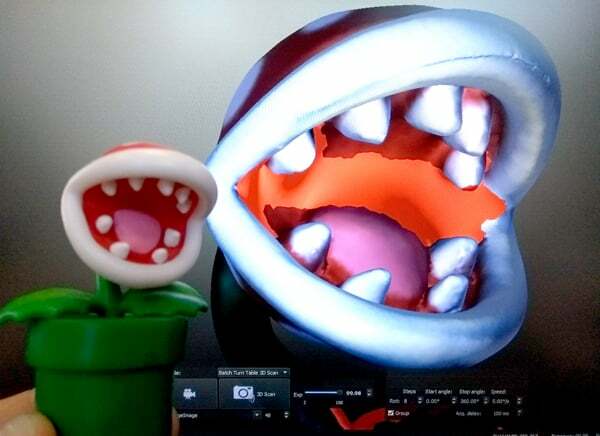 After unboxing both packages, setting up the 3D scanner setup is quite fast. Note that users require no less than 4 USB ports to connect both cameras, the USB stick with the IDEA license and the ATT. To connect a mouse (a must-have for all 3D-related interactions), an auto-powered USB hub or a dock station is a necessity. Setting up the SIAB FX. The 3D scanner “head” itself has a great finish, with all the components robustly fixed on a curved, anodized aluminum bar. This feels sturdy and reliable. The little hooks to hold the USB cables in place are also a nice addition. The whole system is then fixed to the available tripod with a standard camera screw. Connecting everything takes about 5 minutes; this includes fixing the 3D scanner head onto the tripod, plugging in the cables and starting up the IDEA software. In order to take advantage of the full IDEA capabilities linked to this SIAB-FX version, users must go through the licence manager and activate the FX modules. This includes the automatic alignment of 3D scans. The SIAB-FX 3D scanner on the tripod. The whole SIAB FX setup with the ATT. 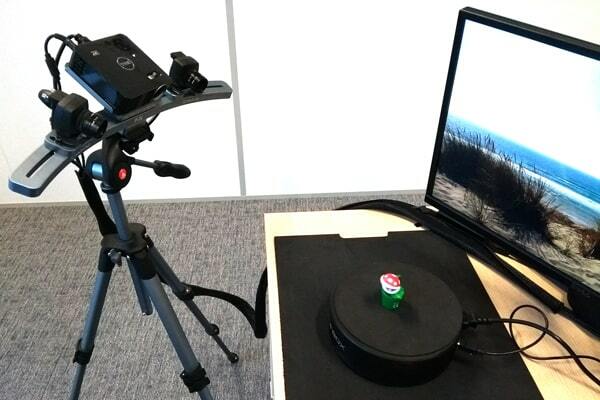 Once the SIAB-FX 3D scanner is attached to the tripod, the next step is the calibration process. This is only necessary if the default configuration doesn’t fit with the user’s particular use case. 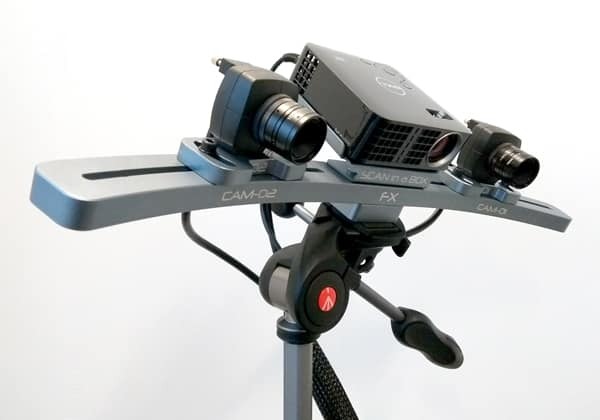 By default, the SIAB-FX is configured for the medium FoV (250 mm), great for 3D scanning medium-size objects. Since the USB cameras focus on the object to 3D scan, their orientation defines the maximum Field Of View (FOV) of the capture. During the hands-on demo, the test object was a plaster bas-relief. The result was quite impressive, with a lot of rich details and very good precision. In a few minutes, we obtained the dot cloud, ready for visualization. Thanks to the ATT, no additional alignment was necessary and it was possible to generate the mesh directly. Since Open Technologies lent us the SIAB-FX, we were able to conduct additional tests with different configurations. In comparison with the SIAB, we noticed various improvements (speed, reliability) on the software side of things. Furthermore, with the special FX configurations, several different and interesting features are now available. 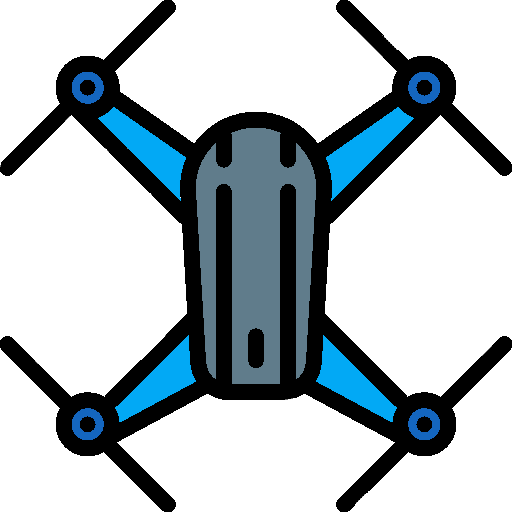 All of the following tests were conducted using the 250 mm configuration and calibration, the best fitting mode for capturing objects measuring less than 10 cm tall on the ATT. This object is only 5 cm tall and in full color plastic, with a lot of intricacies and self-occluding parts. The result is quite amazing on the organic shape (the plant itself), but the flower pot which is pure geometric shapes wasn’t that great. In the end, it isn’t really an issue as such parts are easier to remodel (using the free Blender modeling tool, for example). Side by side comparison of the real object and its 3D capture. This type of object, plaster-like, falls into the “easy to 3D scan” section. However, that means that the result must be detailed and very accurate. With the Open Technologies SIAB-FX, we obtained a very clean mesh. For this model we tested the automatic alignment feature of the IDEA software, in FX configuration. The alignment was done almost instantly. This tea infuser is made from a monochrome soft plastic. It is full of holes, in order to let in water and sink. The result is very good and has many details. After our first impression with the standard Open Technologies SIAB, we finally got the chance to test the SIAB-FX. It is an updated version, based on the same architecture. The IDEA software in its FX configuration is also a lot more powerful, and the generated meshes are of great quality. In the end, we strongly recommend this 3D scanner to all type of users, from wealthy enthusiasts to professionals. The performance is on par with the best products of this category. Also, the price stays affordable for SMEs. With a manufacturer price of €4,490 (not including the ATT or a hard case), the Open Technologies SIAB-FX is not cheap. However, it is definitely a very capable product, powered by good software. Finally, in the same price range, the SIAB-FX’s few competitors are the DAVID SLS-3 and the RangeVision Spectrum. We carry out tests of 3D printers and 3D scanners. Get in touch if you’d like us to review your products!